"The Philokalia" is a collection of texts written between the fourth and fifteenth centuries by spiritual masters of the Orthodox Christian tradition. First published in Greek in 1782, translated into Slavonic and later into Russian, "The Philokalia" has exercised an influence far greater than that of any book other than the Bible in the recent history of the Orthodox Church. "This excellent English translation, which takes into account the latest scholarly research into the original works, represents a major ‘gift’ from the wise men of the East. The fluency of the literary style of this translation and the practical understanding which these writings reveal for the spiritual predicaments facing each Christian in every generation, brings the book well within the range of the ordinary reader who seeks spiritual counsel. 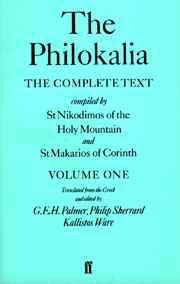 The complet ‘Philokalia’ covers the period from the fourth to the fifteenth century. Volume One . . . Takes us up to the eighth century and is thus the common heritage of Orthodox and Catholics." -Chrysostom Softbound. 378 pp.